Presumable set in the future, circa 2060, in New York we have a successful detective and her associates involved in a murder investigation that was supposed to look like a mugging gone bad. I guess even author J.D. Robb couldn’t imagine NYC being a much better place in the future. That aside there is not much futuristic toys used in by the police except for some souped up communications and what amounts to skeleton keys for buildings in Calculated in Death . As the police get close to the perpetrators things start to get ugly leading up to a climactic ending…sort of. It was predictable in an unpredictable way as the author led us one way and swerved at the end. The novel really didn’t generate much suspense for me, but it was enjoyable. I am not sure about the title other that some accountants were involved. This article was published on Mar 13, 2013 . 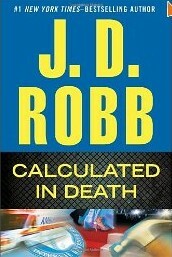 It is tagged calculated in death, j.d.robb, mystery, novel. You can follow any responses to this article through the comment RSS feed.